What is possible to celebrate you might wonder? There has been a lot of time standing on the sidewalk outside of our school to ponder just that. As I was thinking about what to write for this post, I started looking through photographs I had taken over the week. 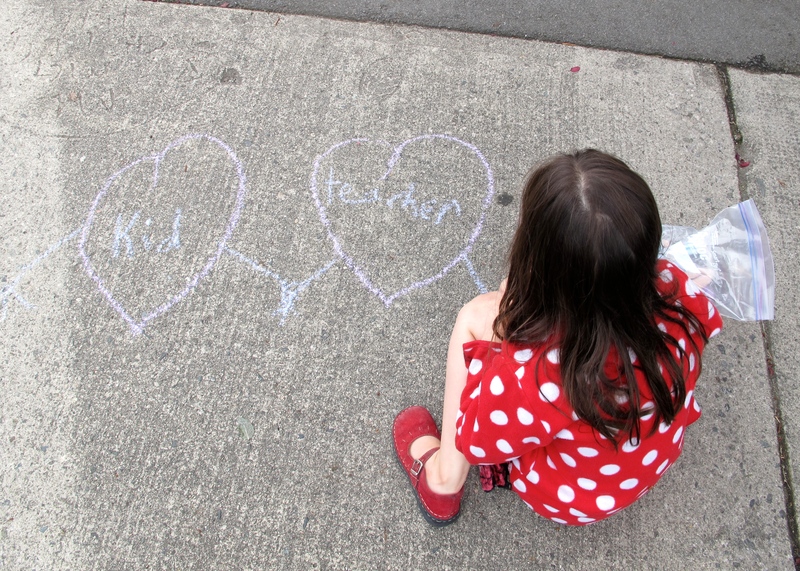 This photograph of a colleague’s daughter crouched next to a chalk image my daughter had written (kid and teacher connected in hearts) stood out to me. This. This is what speaks to me. I celebrate that I am a teacher. Somehow, someway we have got to get back into our building in the fall and again connect our days to working with our students. Standing on the sidewalk. Standing up for well funded, well respected public education. This time has just made the resolve stronger. We need to be working with kids. I am celebrating that I love my job. Passionately. Not being able to do it has been so difficult. I celebrate that I look forward to so many things that represent the magic of the classroom. The buzz of a room full of children completely engrossed in books. Community walks and little voices that wonder and observe and notice everything. The beaming smile of pride that happens when a child grasps “the how” of something new. Gratitude circles where the room becomes lighter with each gratitude statement shared. Finding one student supporting another with a task. Because that’s what we do in our classroom community. Students standing in front of an art display we have created giving each other compliments. Exhaustion and quiet smiles on the bus ride home from an inspirational field trip. The noises of a read aloud. Quiet. Hush. Outrage. Upset. Celebration. Wonder. Joy. Questions. Questions. And more questions. Discovering all of the answers together. I celebrate that somehow there will be a resolution and these things will happen again in my classroom with the students I should be teaching. When you stand on the sidewalk outside of where you really want to be, much becomes clear. Thank you to Ruth Ayres, for the inspiration and her Celebration Link up that she hosts each week. I treasure this #celebratelu community. This entry was posted in Celebrate this Week, Community and tagged Celebration, community by carriegelson. Bookmark the permalink. Wonderful post. The heartache of being shut out when you want to be inside teaching. Those it hurts are always the most vulnerable; our students. I too have been reflecting about what we ask of our students, in my case my kinders. If you have a chance here is a post I wrote this week. Great post Faige. Thanks for pointing me to it. And thanks, as always for your support. I like that last comment – standing on the sidewalk does make you know where you really want to be! You have to stand up for what you believe in but it seems so ridiculous to have to fight for something that people should want us to do – build our future. Teach the kids. Stay strong and united! Yes – education should not require so much fighting! It should be held in a place of honour. Sigh. Thanks for your support Michele. I can’t believe your district is still on strike.Sometimes we just have to stand up for ourselves in order for things to improve. You deserve a fair contract. I truly hope it is resolved favorably very soon. Thinking of you. I can’t quite believe it either. Everyday I wake up with that feeling of “Is it over yet?” But nope. So we persist in hoping. This is such a beautifully written post, Carrie. I can only hope that things will be resolved soon. Just this morning I was writing in my notebook about how blessed I am to be a teacher, how much I love my work, how infinitely interesting and engaging it is for me. I loved that when I visited your post today, I found you celebrating your work. We are truly lucky to be so passionate about our work. We are so lucky. I would feel luckier if I had a sense of when I can do this work again . . . Thanks for your comments and encouragement. Yes. Humanity is why you’re standing out there. Celebrate that you get that and are willing to fight for it. You are such an inspiration to me. Wow, Kimberley – this comment means a lot. Thank you. I hope that things get resolved soon for you. I would also have a hard time with that because I would want to be in the classroom connecting with kids. I think you really captured your feelings so well here. Stay strong and have a good week. Thank you Andrea. Really hoping we are back as usual in September . . .
You are in a situation where it would be so easy to find reasons to complain, moan and quit. You choose to celebrate. It shows your strength. It shows your love. I hope the solution will come soon. Terje – What a truly beautiful comment. Thank you. The support from everyone is so generous. Teachers are worth celebrating, indeed. I wish everyone else can come to this very obvious conclusion as well! It would certainly make a difference in my world right now! Thanks Earl!